Do you have questions about the Christian faith? Are you a new Christian, or are you returning to church for the first time in years? Do you ever wonder about God, Jesus, or the Bible? Are you not sure about any of this but would like to know more? Consided giving church a second chance but are not sure how to come back? 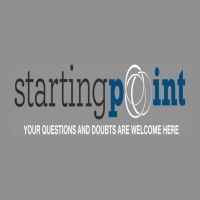 Starting Point is an 8 Week conversation where we will provide a safe place for your questions. We will meet on Wednesdays starting April 24th at 6:30pm. We are looking forward in talking with you in your journey.